Abbott raised over $10 million during the last 12 days of June, according to his campaign, which described the number as record-breaking for the period. The haul brought his cash-on-hand total to $40.8 million. It's a colossal amount of money for Abbott's re-election effort, which he made official Friday in San Antonio — without any serious Democratic opponent. Yet it could also factor prominently into the upcoming special session, which Abbott's team is charging into with an eye on the next election cycle for lawmakers. “We are and will continue to aggressively and robustly support members of the Legislature who support us," Abbott's chief strategist, Dave Carney, said in an interview. "Those who are on our team — we’ll have their back." Abbott's aides have made clear he is taking a different approach to the 2018 election cycle than he did the last one, when he largely avoided direct involvement in legislative races. That led to bad blood with some Republican members who thought Abbott would support them in their primaries last year after they voted for his signature pre-kindergarten initiative. Already, Abbott has laid the groundwork for a bigger political footprint during the special session — and after it. Abbott's campaign has built a satellite studio inside its headquarters and intends to use it extensively during the special session. Aides say Abbott has over 30 TV interviews and over 20 radio interviews planned throughout the first two weeks of the special session. The interviews will be targeted at every media market in the state. In addition, Abbott's campaign has beefed up its ranks in the lead-up to his re-election bid. 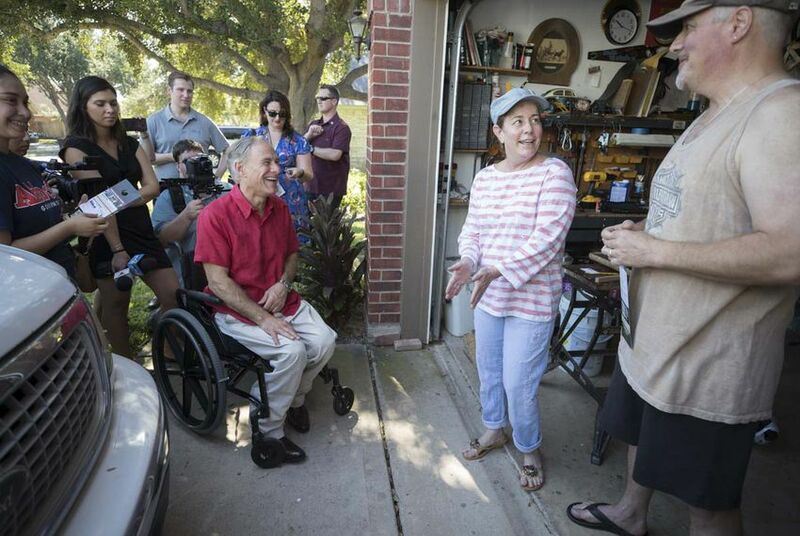 It's up to 37 field organizers and seven regional directors — a group that helped knock on over 10,000 doors Saturday, according to Abbott's team. The short-term plan, according to Carney, is to let lawmakers know that the issues Abbott has prioritized for the special session have "broad, deep support back home in their district." The agenda includes everything from a proposed teacher pay raise of $1,000 to the so-called "bathroom bill" that helped push lawmakers into an overtime round in the first place. Longer term, though, Abbott's team is zeroing in on the 2018 primaries. "They’re going one step further and saying, 'We’re putting our campaign resources behind this and we’re going to tell you we're putting our campaign resources behind this, so oppose us at your own peril,'" said Mark Miner, a former aide to Abbott's predecessor, Rick Perry. "'We’re not messing around.'" Some of the bill authors Abbott has lined up for the special session have already drawn primary challengers back home. They include state Rep. Travis Clardy, R-Nacogdoches, who is taking the lead on two of Abbott's education proposals, including the teacher pay raise. "When it comes to election season, I’m sure Gov. Abbott is going to be there for me," Clardy said, "just like I’m going to be there for Gov. Abbott." Abbott's $10 million haul came during the only 12 days statewide officials were allowed to raise money during the first half of the year due to a prohibition on fundraising around the legislative session. They have to report their campaign finances for that period to the Texas Ethics Commission by the end of the day Monday.